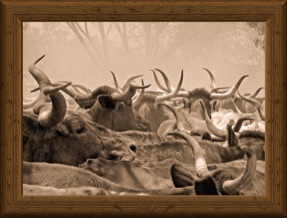 All Texas Longhorn cattle that pass the requirements for registration in CTLR are welcome. Herd history is taken into consideration along with phenotype and genotype. The entire herd of cattle owned by the State of Nebraska at Fort Robinson State Park in Crawford are registered with the CTLR with full pedigree records. This herd was previously owned by the federal government and housed at Fort Niobrara National Wildlife Refuge in Valentine, Nebraska. 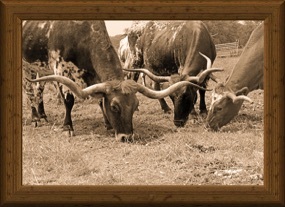 The entire federal government-owned herd of Texas Longhorns at the Wichita Mountains Wildlife Refuge in Cache, Oklahoma was registered with the CTLR through 2002 prior to their management change to natural selection. 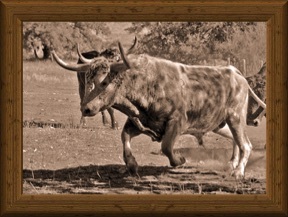 The State Longhorn herds in New Mexico at the Farm & Ranch Heritage Museum in Las Cruces and Texas at the Big Bend Ranch State Park were registered in the 1990's. Animals purchased from the Wildlife Refuge, Big Bend Ranch State Park and New Mexico FRHM must pass visual inspection and a DNA test to qualify for registration. 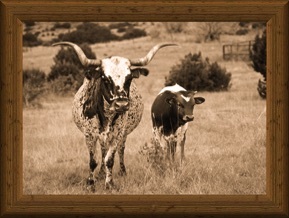 The Official State of Texas Longhorn Herd at Fort Griffin State Historic Site and San Angelo State Park contain some CTLR registered animals. They are using CTLR registered bulls. Female offspring of two registered parents are eligible for subsequent registration. All others must go through the inspection/DNA process to qualify. Registration requirements include a hot-iron holding brand and private herd number. The CTLR is an open registry offering registration eligibility not only to offspring of two CTLR registered parents, but also to animals that pass both a visual inspection and DNA test to fall within the acceptable range of the rest of our registered cattle, regardless if the parents are registered. Female progeny of CTLR registered sires and dams are eligible for registration as subsequent registrants, with no need for genetic and visual inspection. Male progeny of CTLR registered sires and dams must be DNA tested and visually inspected after two years of age. Visual inspection is conducted initially by a team of CTLR inspectors. Texas Longhorns should look like Texas Longhorns. 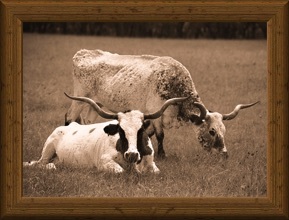 If, in the opinion of CTLR inspectors, an animal does not exhibit characteristics of Texas Longhorn cattle or if an animal exhibits characteristics of another breed of cattle, that animal shall be disqualified for registration in the CTLR. Following visual appraisal, approved animals have a DNA sample collected and sent to a CTLR approved genetics testing laboratory. 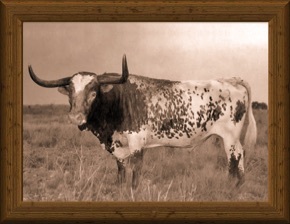 Results from the test indicating no evidence of impurity then permit that animal to be registered with the CTLR as a true-to-type full-blood Texas Longhorn. Cattle produced through live cover, artificial insemination and embryo transfer shall be considered as initial registrants and subject to both visual inspection and blood typing. Travel and lodging expenses may be shared by breeders from a given area.